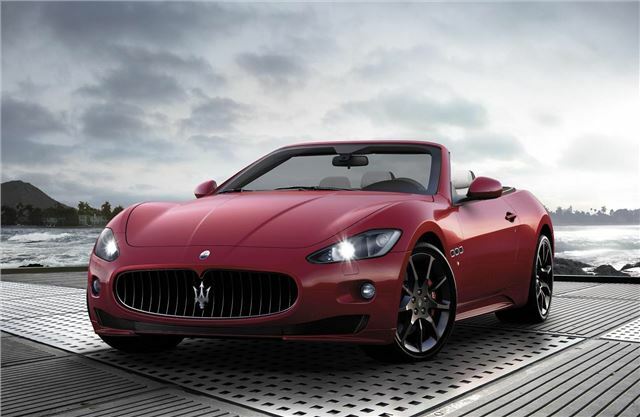 The Maserati GranCabrio Sport will cost £102,615, and first UK deliveries of the soft top GT car will be in October 2011. The Sport variant of the GranCabrio is more powerful than the standard model, it’s 4.7-litre V8 producing 450bhp, up by 16bhp, and 510Nm of torque, up by 20Nm. Top speed is 177mph and 0-62mpg takes just 5.2 seconds. The gearbox is a six-speed ZF automatic. Despite the improved power and torque figures the Sport is 6% more fuel efficient than the standard GranCabrio. Suspension has been revised to give a ‘sportier’ feel, as has the braking system. The exhaust system has been revised, too with the bypass valves automatically opening when the car is in Sport mode – giving an enhanced sound. The exterior of the GranCabrio sport has been revised and features black details on the grill, headlights and exhaust tips. There are new redesigned front corner splitters and side skirts, and giant, 20-inch alloy wheels to complete the look. There’s also a new metallic red paint option called Rosso Trionfale. Internally there are new leather colours; a brilliant ivory called Bianco Pregiato, and a dark shade of grey called Grigio Chrono.